You are here: Home>Journal>Why Do We Eat Chocolate Eggs at Easter? 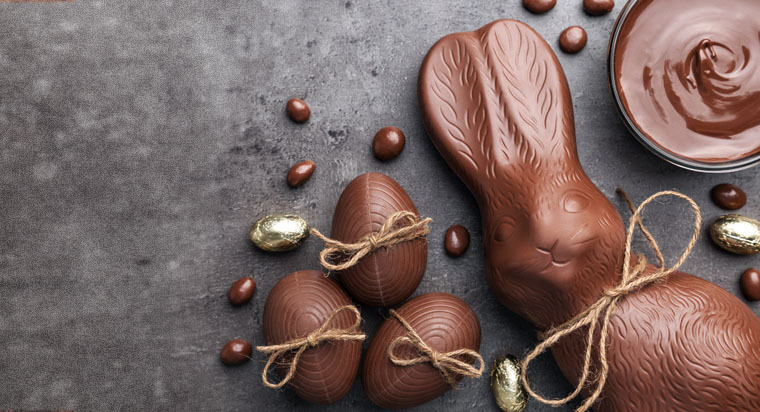 Whether you’re a young child or a fully grown adult, the idea of a day dedicated to eating chocolate sounds like a dream. No matter how sick you feel the day after, lessons are rarely learnt. We simply carry on this tradition of over indulgence. Consuming more chocolate than Augustus Gloop in a chocolate river. As we know, Easter celebrates the resurrection of Jesus Christ after he passed on Good Friday. Rising again on Easter Sunday. Although there is no conclusive biblical connection, some link the two metaphorically and see the egg as a symbol of new life. The oldest recorded tradition saw people ornately paint chicken eggs to gift to friends and family. The modern equivalent of this is, well, less meaningful. With chocolate eggs simply being wrapped in coloured foils. We don’t think this is anywhere near as enchanting as how our ancestors celebrated this occasion in the past. So, we want to change this, by combining the theatre of the past, with the tastes of today. This year, why not go for quality? Have a go at making your own unique flavour of Easter egg or chocolate truffles by combining your favourite flavour St. Dalfour Preserve with a chocolate of your choice. Our St. Dalfour Raspberry Preserve goes perfectly with white chocolate to create a wonderfully fruity, sweet treat sure to make a stunning gift this Easter. Why not combine Milk chocolate with our St. Dalfour Thick Cut Orange Preserve to create chocolate orange truffles sure to evoke memories of treats from your past. Add some St. Dalfour Apricot Preserve to good quality dark chocolate to create a bitter sweet Easter egg to get your taste buds tingling. With 19 St. Dalfour Preserves on offer, why not have a go at creating your own fruity chocolate treats and tweet us what you make!